Home News What Happens to Bankrupted Company’s Clients? 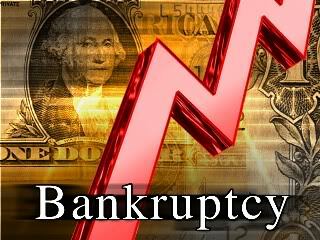 Companies become bankrupt, it happens all the time. They invariably leave creditors in their wake, because the very reason for bankruptcy is normally that there is a lot of money owed to someone – and there are often lots of these someones. When companies go spectacularly bust we will see headlines about the company, its debts, its trading history, etc. We very seldom, however, see anything about the people left behind, saddled with any debt which can’t be recovered from the carcass of the expired company. Banks are normally first in line for payment, it’s in their contracts, and they will usually have their debts attached to assets which can be sold to recover what is owed to them. No such luck for the average punter who’s debt is seen merely as a minor irritation. This is an issue which has become extremely high profile in the overseas property industry in the past few years. Essentially the industry has ground to a halt in terms of property sales. The result? A lot of companies with very large overheads and very little current cashflow have hit a brick wall. The two most high profile cases in Ireland are undoubtedly Michael Lynn’s KenDar Holdings which sold property in Portugal, Hungary, Slovakia and Bulgaria. Lynn very publicly left the country under a huge cloud owing the Irish banks an estimated €80m and his clients a further €13m. The banks are working to get their money back; the clients? As usual, left in Limbo. Another very high profile entity was Ennis based Larionovo which sold property in Portugal, Spain, Dubai, Hungary and India. The company was pronounced bankrupt last November. This was at a time when hundreds of its clients were due to receive refunds for deposits placed on properties in India, from which the company had decided to withdraw due to issues with the repatriation of funds from India by NRI’s (Non-Resident Indians). The upshot? Larionovo is gone but most of its Indian investors have still not received refunds for their deposits. I spoke with Karen Marshall, who has quite literally been ‘marshalling the troops’ in negotiations with Dubai based Profile Group in order to effect the transfer of their funds. Profile was the master agent for the Indian developments, with Larionovo acting as a sub-agent in the Irish market. There has been no argument against the investors receiving refunds for their deposits, but Profile is, says Marshall, very much dragging its feet in the negotiations. It has instigated stalling manoeuvres, asking for multiple copies of documentation which Marshall says it has already received and generally slowing the process to a crawl. A small group of investors who had been in contact with Larionovo before the liquidation became public knowledge, decided that they should start highlighting their plight. RTE Radio One’s Joe Duffy show featured the issue and a group member arranged for them to meet Sligo and Leitrim TD, John Perry, in the Dail to communicate their issues. From there the group decided to pay an adhoc visit to Grant Thornton, the liquidators appointed by the High Court to oversee the winding down of Larionovo. The outcome was an invitation to form a committee to represent the investors, along with Grant Thornton, on the issue of deposit refunds. The investor group currently stands at 145 and Marshall says there are another 150 investors which, for one reason or another, haven’t been in touch. The group has also visited the Indian Embassy in Dublin where it met with Minister Naithani. This, says Marshall, proved quite beneficial as correspondence was sent to Sigrun Realties in India asking for clarification on the issue. She’s a very determined lady and you’d have to say that it would be a gambler that would bet against her and the rest of her group, getting their just rewards, but it shouldn’t have to be like this. Without adequate policing of the property industry we are going to keep revisiting such situations. There is still, three years after the announcement of the proposed National Property Services Regulatory Authority (NPSRA), no statutory regulation of the property industry in Ireland. But that is an article for another day. For details of what’s happening with properties sold by Larionovo and Profile please visit the Dubai Action Group website.